From time to time I put bits of information about life with dogs that I myself have experienced or have had to help deal with consequences involved in issues that can result in harm – further down you will see advice about toys/food/elderly and sick dogs etc. 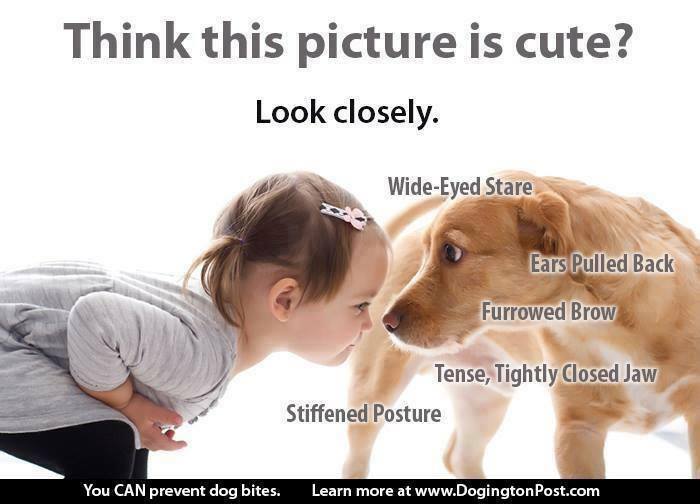 Here is one that is particularly well portrayed in the picture and needs to be taken very seriously where children and dogs are together…. no matter whether they be the family children, grandchildren (as in my case) or visiting children. It looks innocent enough, but this dog could be a split second away from biting this child in the face, because all his signals are there because he feels threatened and worried. The child means no harm as such and cannot be expected to understand or read those signals……ADULTS be aware and never leave young children alone with dogs EVEN those we think are normally patient and well behaved….. dogs have their ‘off’ days too where small, noisy, boisterous children are concerned! It only takes a second for this to become dangerous and it’s not the dog’s or the child’s fault…..it’s the adults in charge! My children were never left alone with my dogs & if they touched them without asking me it was the child in trouble…Please take notice of this it is very true !!!!!! The dog is warning you in the only way it knows how but alas it falls on to deaf ears…. From that day to this I have always put the dogs away when the grand children come calling.. Better safe than sorry !!!! !